Under James Levine’s passionate direction, this all-star cast brings Beethoven’s magnificent opera to blazing life. 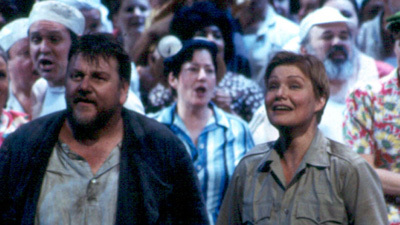 Karita Mattila is heartbreaking as Leonore, the wife desperate to find her imprisoned husband, Florestan (Ben Heppner), a victim of his political enemies headed by Don Pizzaro (Sergei Leiferkus). René Pape is Rocco, the good-hearted jailer who can’t stand up to his boss but who wants to do the right thing.